This is an Eros Entertainment brand of the Hindi DVD. Has no UPC Code. Has Eros Seal AA 869982. 168 minutes Black & White. Dolby Digital AC3 Sound. NTSC FORMAT. HAS ENGLISH SUBTITLES. Written, Produced & Directed by: I. S. Johar. Music: S. D. Burman. Starring: Kishor Kumar, Mala Sinha, Pyan & I. S. Johar. Release Date: 1960. In his quest for a heir, Rai Bahadur has an affair with a prostitute Meher. When Meher becomes pregnant he promises to take the child and educate him. But fate has other plans, for his wife Meena also becomes pregnant at the same time, and shortly thereafter both women give birth to two boys. Meher threatens to expose him if he does not take her son, and leave Meena’s son in an orphanage. However, both children end up in his palatial home. He belittles Meher’s son and finally accuses him of stealing. Fed up of these accusations, Meena leaves the house with Kishore, and ironically ends up with Meher. In the meantime, Rai’s son has grown up to be an arrogant, and a champion boxer. And it is in the boxing ring that both half-brothers will meet again -- for a match of their lives -- as the trophy is none other than the beautiful Mala -- who both love and hope to marry. 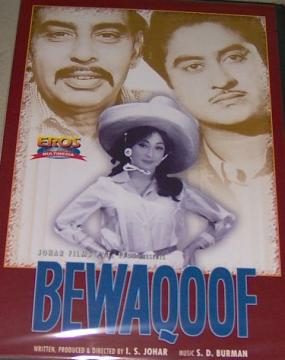 Buy Bewaqoof (DVD, 2000), sold & shipped by Movie Time Video where you can shop online for Pooja Mandir, Bajot, Gifts, Hindi Movie DVD / CD, Music Video. This Hindi Movies collection has been tagged as ER8 1 RR 2.50 9.49 kishor kumar mala sinha pran i. s. johar.